Home / Spring Is A Great Time To Move! Moving can be tough. Why make it harder on yourself (and your family), by picking a bad time to get the job done? If you are considering a big move, think about what time of the year will offer the most benefits. When you consider weather, the cost of moving services, and even housing availability, spring comes to mind. A good time to make a fresh start in a new home, the springtime months offer the perfect balance to make your move easier on everyone. When looking for moving services, you may be surprised at the cost differences between moving during the blustery winter weather and the busy summer months. 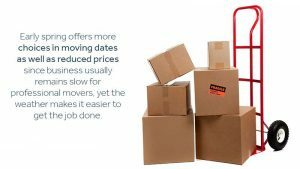 Early spring offers more choices in moving dates as well as reduced prices since business usually remains slow for professional movers, yet the weather makes it easier to get the job done. Weather can play a vital role in making a moving experience simple and quick. Wintertime can present a variety of weather-related delays including snow, ice and strong winds. Summertime is usually too hot and humid for crews to be as efficient as normal. While fall temperatures can be more stable, there is always the risk of larger storms to cause moving day chaos. Spring, however, affords the best weather for moving. Sunny skies and warmer air make the experience easier to handle and more enjoyable. Even the periodic spring rain isn’t as harsh as found other times of the year. Spring cleaning is a common phenomenon. After being cooped up indoors for months on end, most people throw open the windows, anxious to get their home cleaned and clearedwith the arrival of spring. That makes this season an excellent time to clear out of the clutter that you don’t want to take to your new home. By cleaning up –and clearing out – you can make the entire move that much simpler. With lighter schedules in the spring, professional movers have a lot more openings available for your move. This can make setting a relocation date much easier. 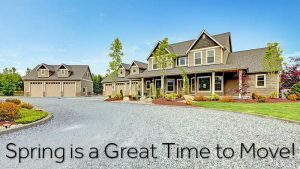 Spring is the peak season for listing and selling a home. This makes it the optimal time for both finding a new place to live and selling off the one you have now. There are some real benefits to moving a child’s school in the spring. While they will still be the new kids, spring offers the opportunity to get outside and meet the neighborhood kids and get more attention at their new school before everyone leaves for summer break. That will give your child a few months to build lasting relationships before the start of the new school year. When moving your home and your family, you have to feel confident that your crew can handle the job quickly and efficiently. At Zippy Shell, we use only expert movers who know how to get your belongings from one location to the next with minimal hassle. By providing clients with curbside storage units they can pack at their leisure, the entire process is more individualized. No more rummaging through stacks of boxes the movers placed somewhere in your new home. Since you pack every box, you will know what’s in it. Just let our moving crew bring your storage shell to the new location and help get everything inside. Call today to of find out more about Zippy Shell Greater Columbus moving services. We’re offering 50% content protection! If you mention this blog post, you’ll get $40 off storage rental!